I’ve already discussed VDOE’s byzantine, opaque process for “adjusting” pass rates to calculate accreditation status. 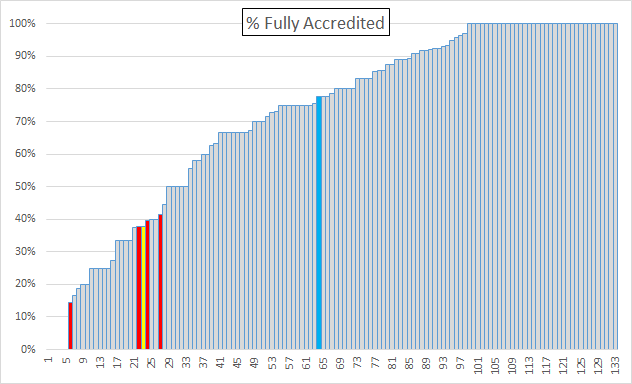 So, without further comment, and for whatever these numbers may mean, here is the distribution of Full accreditations by division. Richmond is the yellow bar. The red bars are, from the left, Petersburg, Norfolk, Newport News, and Hampton. The blue bar is the state average. VDOE invented several forms of “nearly pass” categories this year. Here is a list of the categories that appear in this year’s database, along with the abbreviations I had to use to fit the table below on the page. The complete list is here and the press release explaining the new categories is here. Finally, here is the table, sorted by division.